Hair Fair Bandanna Day!! Decorate One For Wigs For Kids!! Please visit the official Hair Fair 2017 Website for step by step directions on how to make your bandanna as well as see examples of past ones. The idea is to decorate the bandanas provided with either a texture (textures must not have images or logos of RL products or copyright material) prims/sculpts/mesh, or both (NO HAIR) and return it full perms to CharitySasy String – Perms will be changed to No Copy and sold Mod/Transfer as we do every year, so people can buy for others. We also encourage you to create a notecard that explains why you have decorated the bandana, as many people have their own stories as to why they support this cause. You do not have to do this, it is just something we will include in your bandanas box to share with the person that buys them. 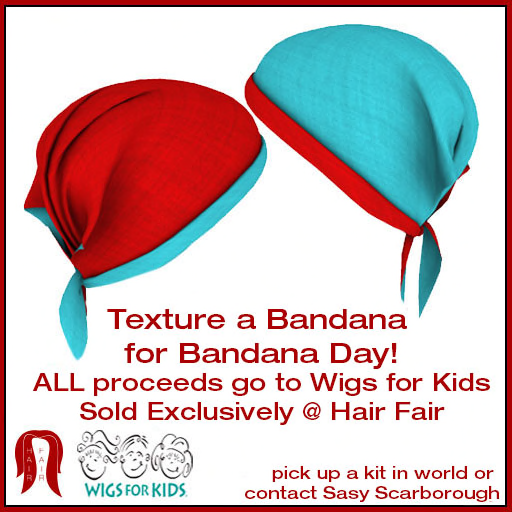 All money from the sale of these bandanas will go to Wigs for Kids and will only be sold by the Hair Fair Committee at Hair Fair 2017. After the event the bandanas will be unavailable, so after Hair Fair there is no reason for you to keep these other than for personal wear, but we hope also that you will buy some for that. Thank you, in advance, if you choose to participate. If you need a kit, please contact Sasy Scarborough. Or you can purchase it for 0L at Winx & Flair in world where you will also find the Hair Fair Subscribo, so you can keep up to date with all news. Please only use this kit for what it is intended for.